Euro-med-online.com was another one of the many drugstores offering services online and claiming to have their physical location in Canada. According to on the drugstore copyright section, the drugstore was operational between 2004 and 2013. The store focused on selling medications which had already been approved by the FDA. Looking at the drugstore catalog, I realized that the pharmacy was selling medications for a large number of health complications. These include allergies, antifungal medications, antibiotics, anxiety meds, arthritis drugs, meds to help those suffering from asthma, blood pressure pills, and others. The pharmacy carried both brand and generic medications. To determine how affordable this drugstore was, I decided to check the price at which the erectile dysfunction pills were being sold on the drugstore. I realized that Euro-med-online.com had fair prices. Generic Viagra and Brand Viagra would have cost the buyer 0.87 dollars and 5.5 dollars per pill respectively. Generic and brand Cialis were 1.79 dollars and 7.56 dollars per pill respectively. Generic Levitra was worth 2.62 dollars for each tablet. The cheapest pharmacy I have found only costs more than 50% cheaper than Euro-med-online.com. However, when you compare the prices offered by Euro-med-online.com, you will realize that they were more than 80% cheaper than what the local drug stores were selling the same meds. The pharmacy had some nice payment methods. It allowed its buyers to pay for their meds using credit cards. The credit cards accepted by the drugstore included VISA and American Express. The pharmacy was also accepting payments via the E-Check. The credit cards were charged immediately after the order had been placed. Medications were being shipped either via airmail or EMS courier delivery. Buyers who decided to use airmail shipping would have needed to pay 10 dollars for the shipment. This method of shipping was slow since it took approximately 14 to 21 business days. A buyer planning to have medications shipped via this method had to order about a month in advance if the meds that he or she was ordering were prescription meds. EMS shipping is faster which contributes to its being twice the cost of Airmail shipping. EMS cost 20 dollars but took 3 to 8 business days to deliver medications. The pharmacy was not accepting any returns. If the buyer was not satisfied with the quality of the product that he or she had received, he could contact the customer support team. The pharmacy promised to re-ship damaged, defective, and wrong deliveries free of charge. The drugstore did not indicate whether they were offering refunds. The store did not have a live chat feature on the pharmacy website. However, a buyer could use either +1 760 284 3222 (US) or +4420 3286 3829 (EU) to call the customer support department. Pete reports that he had purchased a product from Euro-Med Online. He received the product but it was not good. The store delivered a fake product to him. After taking the drug, it never produced any positive effects. He wants his money back. He says that none of their phone numbers could be used to contact the pharmacy. The pharmacy has never been in CIPA’s database. A drugstore that lies about approval in order to try and fool customers can lie about anything. Euro-med-online.com did not survive long enough to see 2018. For this reason, there are no any 2018 testimonials for the store. I checked the drugstore on scam adviser. The site appears to be hiding its physical location. Scam Adviser could not determine whether the pharmacy is located in the Netherlands or the US. The pharmacy has 0% safety rating. This can be interpreted to mean that buyers who would have sourced medications from the drugstore would have been putting themselves in danger. The pharmacy was offering free shipping to buyers who bought meds worth more than 200 dollars. The store promised to help customers save more than 70% in comparison with the price the local pharmacies sold the same medications. The store was offering free Viagra pills as a bonus. 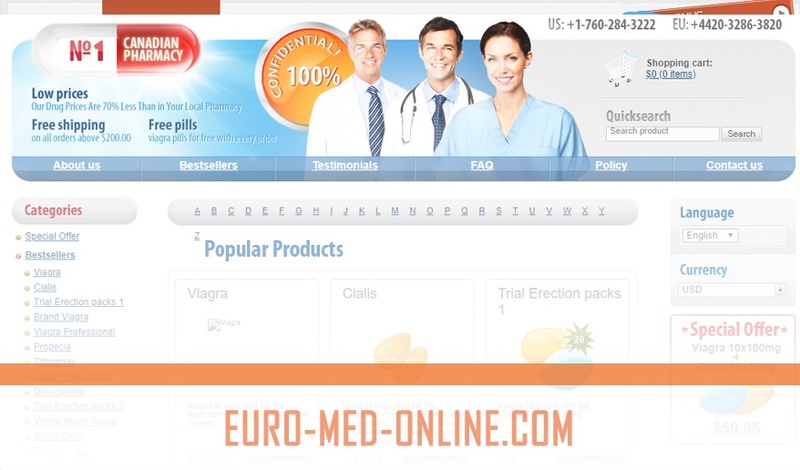 Euro-Med Online is a drugstore that probably went down for offering mediocre services and drugs to customers. The external review I found proves this. The pharmacy had nice testimonials on its official website. However, these are unproven reviews and hence they cannot be trusted. The store had fair prices. However, these were still expensive. I have found online drug stores with much better prices.